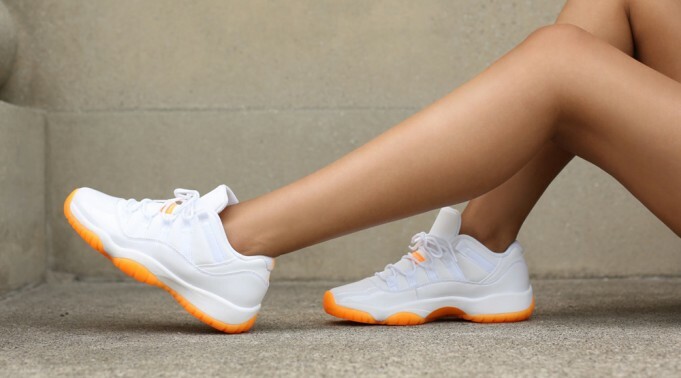 Who Else Could Use An On-Feet Look At The Air Jordan 11 GS Low “Citrus?" This weekend is full of great releases. One special release is coming to retailers just for the ladies. The Air Jordan 11 GS Low “Citrus” is making its way to retailers, and will be yet another Jordan Brand GS exclusive everyone wants. The sneaker was originally released in 2001, and is finally making a return after a long 14 years. The Air Jordan 11 GS Low “Citrus” is one for the classic Air Jordan 11 Lows we've grown to love. Even if you can't fit into a pair, there's no denying these are dope. Clean white uppers are complimented by citrus hits on the tongue, heel, and outsole. The Air Jordan 11 GS Low “Citrus” is the perfect Summer sneaker, and will be available June 20th for only $120.